Gurupoornima day was celebrated by the yoga students, and Sandeepani Sishuvihar children on 19th. Lakshmi Didi addressed the morning batch yoga students in the morning. She highlighted the significance of Guru in ones own growth and the need for paying their reverence to all those teachers who contributed to becoming what they are today. 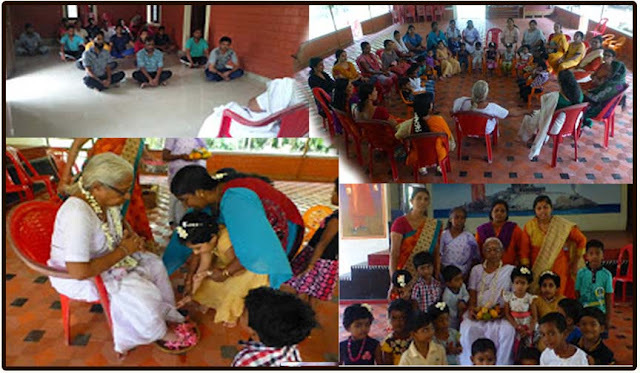 Sandeepani Sishuvihar children did pada puja to Lakshmi Didi and sought her blessings. She blessed them and addressed the noon batch yoga students. In her address, she requested all the mothers to play the vital role in the growth of children befitting to the dictum of Matrudevo Bhava.